One of the first things many people do when they wake up in the morning, or after a long day at work, is twist their neck or spine until they feel those familiar, relieving pops running down their back. As a matter of fact, studies have shown that up to 45% of people crack at least one of the joints in their body on a daily basis. But anyone who has cracked their back, knuckles, ankles, toes, etc. for a long time has likely heard the rumor that the habit can do some terrible things to your joints, including causing arthritis. But are those rumors actually true? In moderation, the answer is no. Studies have shown that occasionally cracking your back can help relieve pressure in your spine without adverse effects. However, when done habitually, popping can cause excessive wear on your joints and potentially lead to premature breakdown. It turns out that many smart, and a few reckless, people over the years have wondered what the effects of habitually cracking joints are. This being the case, there has been a lot research done on the topic. We wanted to make sure that everyone knows what a joint actually is. Simple enough. We wanted to explain why joints actually crack. If you know all this information, feel free to jump right to our review of the research. Every time two or more bones in the body come together, they are connected by a joint. There are approximately 360 joints located throughout the human body and their primary responsibility is to connect the bones and, depending on the type of joint, allow smooth movement at the point of connection, much like a hinge connects a door to the wall. Fibrous Joints: Fibrous joints are the only joints in the body that don’t move. They are made up primarily of collagen and are used to unite two different, immovable bones together. For example, the cranium portion of your skull is made up of eight bones. These bones are connected by fibrous joints. Cartilaginous Joints: Cartilaginous joints allow for limited movement and hold bones together with (surprise, surprise) cartilage! Cartilaginous joints are the ones responsible for holding the vertebrae in the spine in place. Synovial Joints: Synovial joints are probably what you think of when you hear the word “joint”. They’re the joints that make up the shoulders, elbows, knees, toes, etc. and allow for the most movement between bones. It’s also important to note that these joints contain synovial fluid which helps ensure smooth movement. 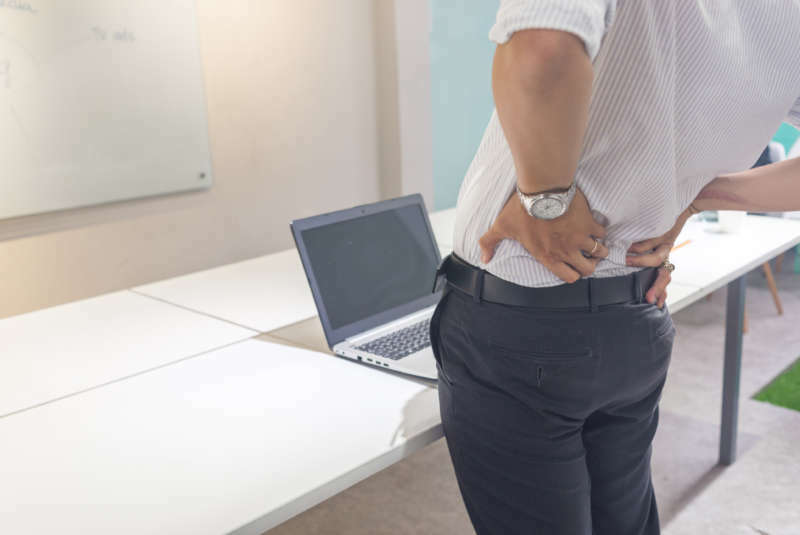 There are a number of a reasons that your back can crack, but it’s typically the result of gases like nitrogen and carbon dioxide being put under pressure in the joints of your spine and forming bubbles. Notice we said “typically”. Here’s the thing: no one is exactly sure why your joints pop when you put pressure on them. Way back in the day (aka 1947), two doctors at St. Thomas Hospital in London tried to figure out why joints crack. To do this, they tied a string around the fingers of several volunteer’s fingers and pulled until they heard the knuckle crack and captured it all using x-ray images. In the end, they found that a popping sound occurs when two joint surfaces are pulled apart, causes a rapid drop in pressure within the synovial fluid and forms a gaseous bubble in the cavity. This conclusion has been hotly disputed over the years because, 24 years after it was reached, researchers performed a second study using similar methods and decided that it was the gas bubble in the joint bursting, not forming, that made the tell-tale popping sound. The devil is in the details, right? In the name of science,Gregory Kawchuk, a bioengineer and rehabilitation-medicine specialist at the University of Alberta in Canada decided to finally put the debate to rest. However, unlike the researchers before him, Kawchuck had the power of technology on his side. He used a magnetic resonance imaging device (MRI) to record a test subject’s finger being slowly pulled until it cracked. Well to put it simply, your joints make a cracking sound when a bubble forms. Typically, this happens when tension mounts in a joint to the point where synovial fluid rapidly accumulates and cavitation occurs. Cavitation is, by definition, the formation of bubbles in a liquid or fluid due to an outside force acting upon it. For example, a boat propeller creating bubbles in water would be an example of cavitation. When cavitation occurs within a joint, the gases found in the synovial fluid form a bubble and create a cracking sound. This bubble can last up to 20 minutes in the joint and the joint will not be able to crack again until it disperses. Did you notice the black orb that appears when the joint is pulled apart? That’s the gas bubble forming and what makes that popping sound. Do you see the bright object end of the video that appears between the two bones that were pulled apart? Once again, that’s the bubble forming and when the cracking sound is emitted. Now, a forming gas bubble is certainly the most common reason you hear a cracking sound coming from your joints, but it isn’t the only way it can happen. The movement of tendons, ligaments and joints can also produce a similar snapping sound when they move out of place and return to their original position. Additionally, rough joint surfaces typically caused by arthritis can make grinding sounds when they rub together. The Research: Is cracking your back bad for you? As we mentioned above, studies have shown that cracking your joints really doesn’t have any adverse or beneficial effects on your bones or joints; unless it’s causing pain. For years, the idea has been circulated that if you pop your joints frequently, you’ll end up with arthritis. It’s unclear when, how or why this this myth started circulating, all we know is that, despite growing amounts of research to the contrary, people still believe the old wives tale. Well, to prove it, we’re going to dive into some of the research that has been compiled on this topic over the years, starting with a brave man named Dr. Donald Unger. Dr. Unger took science into his own hand (literally) after he grew tired of the renowned authorities in his life, “(his mother, several aunts and, later, his mother-in-law) [informing] him that cracking his knuckles would lead to arthritis of the fingers.” He popped the knuckles in his left hand at least twice for 50 years, comparing the difference between the knuckles he cracked and those he hadn’t. In another study by the Uniformed Services University of the Health Sciences, researchers looked at 250 people ages 50-89, 20% of whom popped their knuckles on a regular basis. They found that, of the knuckle poppers, 18.1% had arthritis in their hands compared to the 21.5% found in people who didn’t crack their knuckles. This study showed that the chances of you developing arthritis in your joints are virtually the same, regardless of whether you crack them or not. I think we can say with confidence that there is no link between cracking your joints, whether it be your knuckles or your back, and arthritis. That said, there are other factors that come into play when you pop the joints in your spine. Many chiropractors will argue (correctly) that the elements in your spine are far more complicated and vital than than those in your knuckles. This being the case, it can be dangerous to put unnecessary pressure on the joints. One study even found a link between spinal manipulation and strokes. Of course, cases this extreme are very few and far between and typically only occur in older patients whose bones are more brittle. More commonly, spine specialists will argue that problems can occur if you crack your back in a habitual manner or multiple times a day. The problem is not with cracking itself, but with the pressure that you’re putting on the ligaments, tendons and other soft tissues that make up your joints. These structures can wear out over time, producing pain and other potential problems within the spine. However, the general consensus from doctors is that occasionally cracking your spine isn’t a problem and can even provide positive mental relief from back pain. That said, there is little evidence to suggest that cracking your back yourself actually provides any real health benefits. So why does it feel relieving when you crack your back or joints in general? One reason could be that movement in general helps reduce pain. Ronald Melzack and Patrick Wall developed what is now known as the Gate Control theory in 1965 which, in a nutshell, argues that non-painful input (such as movement) closes that “gates” to painful input and keeps it from traveling through the central nervous system. Some have argued that simply moving a specific location of your back that’s hurting could be enough to block pain signals from reaching your brain; providing temporary relief. Another reason could be that people interpret the popping sound that comes from joints as a sign that what they’re doing is helping. In a 2011 study, researchers found that, when people hear an audible sound coming from their joints, they typically associate the crack with a physical feeling of release and relief, even if the adjustment didn’t do much. That said, stretching your back in order to crack it can provide a real feeling of relief for many people who spend much of their day sitting. This is because many of the muscles that support the spine can grow stiff and tense after long periods of inactivity and stretching them, even if it's done to inadvertently crack your back, can feel really good. This can lead your brain to interpret and associate the feeling of cracking your back with a looser, more flexible spine, even though it was the stretching of the muscles that actually provided the feeling. Finally, there have also been some claims that endorphins are released when joints are popped, providing a pleasurable feeling and temporary relief. However, there hasn’t been enough research on this hypothesis to say definitively whether it's true or not. Like most things in life, balance is key. It’s okay to crack your back every once in awhile, but if you do it habitually, you could be setting yourself up for potential problems. It’s also important to note that, if you feel the need to crack your back multiple times a day to help relieve pain or stiffness, you may not be addressing the root of your problem. Daily back pain is not normal and if it’s something you experience you should get in touch with your spinal professional.